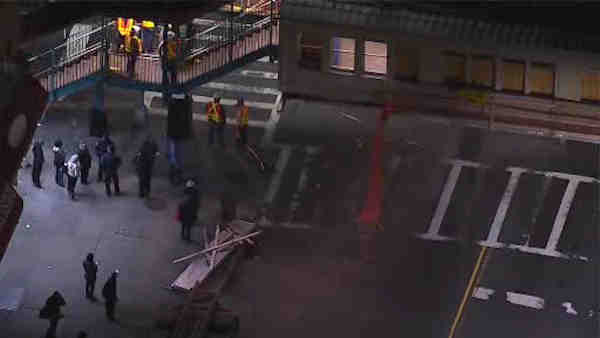 A box truck struck an elevated train station in Brooklyn, causing subway delays. EAST NEW YORK, Brooklyn (WABC) -- A box truck struck an elevated train station in Brooklyn Thursday morning, causing damage that the MTA expects will take weeks to repair. The incident happened at the intersection of Pennsylvania Avenue and Livonia Avenue and caused a partial suspension of the No. 3 train from Utica Avenue to New Lots Avenue as the damage was evaluated. Service resumed with delays, but trains continued to bypass Pennsylvania Avenue. In the afternoon, the MTA reported the discovery of damage to the station that will take time to repair, prompting a closure that is expected to last at least a couple of weeks. An advisory was expected to be released shortly.